Can You Help to Identify This Vase and Ceramic Dog? From time to time readers of this blog and pottery collectors that we have met at events have sent us photos of items to identify and or appraise. Most of the time we are able to thumb through our library of pottery reference guides and books and identify the item and offer a brief history of the maker and a “book price”. Frequently we find an article or the mentioning of an item through a web search. Sometimes we get lucky and can even offer recent auction prices which helps in the overall appraisal. Every once in awhile (or in today’s case “twice in awhile”) we are stumped by an item and either unable to identify its’ maker or locate some information on the history of the item in question. So dear readers, having been recently stumped twice we are turning to you to help shed some light on two interesting pieces of pottery. 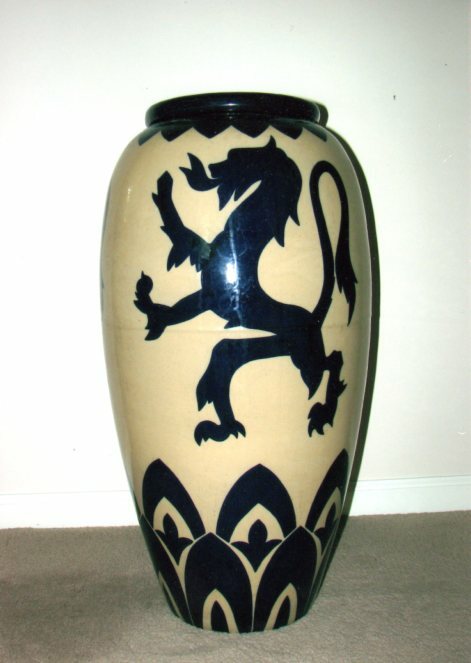 The first item is an impressive thirty-one inch floor vase made by the Western Stoneware Company of Monmouth, Illinois. The ink stamp is clear on the bottom of the vase (see photo) and there is also a black “X” next to the stamp. Two things come to mind when looking at these markings. The first is that the “X” might indicate that this vase is a “second” and did not meet the maker’s standards. 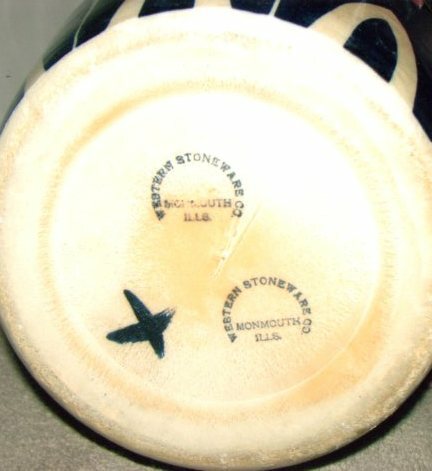 The second thing to note is that Western Stoneware bought Monmouth Pottery in 1905 and became the Monmouth Western Stoneware Company in 1906. The word Monmouth is missing from the stamp and might indicate that it was made before the merger. The vase appears to be a floor vase or perhaps an oil jar, although the decorations seem extreme for an oil jar. The lion rampant is representative of the English Order of the Garter. As for further information on this vase I turn to you, our readers, and ask that you e-mail us either through the comments section below or to our direct e-mail address BillyBlueEye@cox.net. 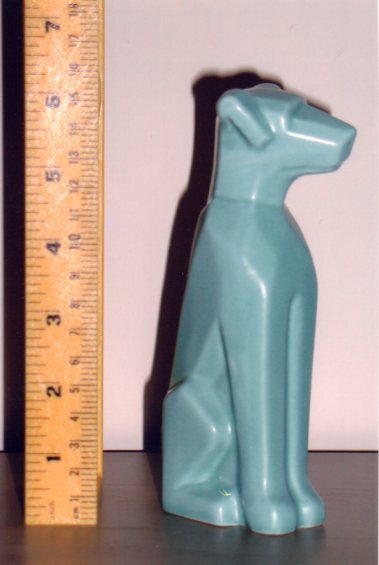 The next item that we are looking to identify is a handsome six inch turquoise seated dog figurine. The owner of this item states that there are no markings or imprints whatsoever on the bottom or anywhere else on the item. 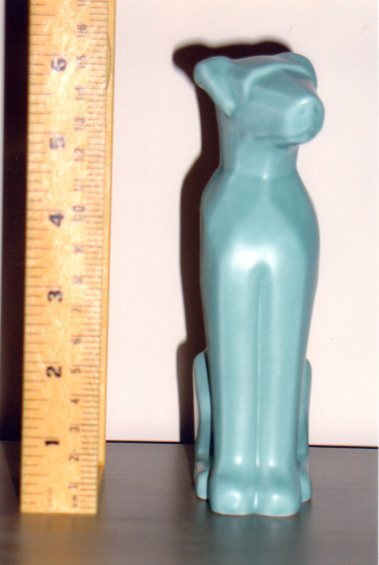 The glaze color of this figurine is certainly very similar to the Ming Turquoise glaze employed by Van Briggle. However, the over-spray color is absent. This certainly could be a unique work by an independent ceramicist however the item seems to have come from a mold. Again, dear readers anything you can tell us about this attentive pup would be appreciated. Again use either the comments section below or e-mail us direct at BillyBlueEye@cox.net. We will publish all responses to this post and hope that together we can put together an accurate history and appraisal.